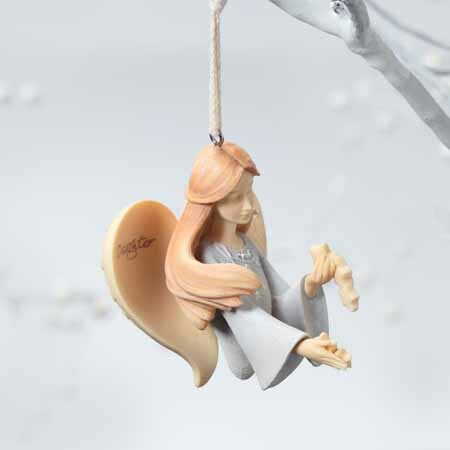 Daughter Angel Ornament | Foundations Angels Figurines | One Price Low Flat Shipping! From the Foundations Christmas Collection, Daughter Angel Ornament. Made of crystal and stone resin. Measures 3" tall. This hanging ornament is to express love to daughters. It bears the message, "As many stars there are in the sky, that is how much you are loved." Perfect gift for a daughter. This joyous angel has stars cascading from her hand. The front of her wing says 'Daughterr' and the special message is inscribed on the back of her wing.